Support and encourage a healthy lifestyle of physical activity by supporting students who bike to school! 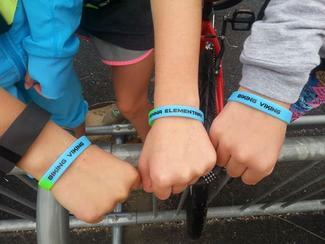 Hand out Biking Viking bracelets to biking/scootering students, who have worn helmets, on Friday mornings from 8:15-8:45 a.m. Please arrive 5 minutes early so you can enter the school and retrieve the bracelets from the front office. Note to Volunteers: The goal for Bike Fridays is to create a culture of biking. Bike Fridays happen rain/shine! But there are a few exceptions that warrant cancellation: ice, extreme conditions (e.g., high winds/lightning). When there's inclement weather, volunteers should use their best judgment in deciding whether to be available to hand out bracelets. The PTA will announce rare events of cancellation online via social media. Questions? Please contact Cheryl Levine at [email protected] or 201.396.7043. Please only give bracelets to kids who bike or scooter to school and wore a helmet.